Fei lives in a village where no one can hear - their ancestors, trapped atop a mountain by avalanches, lost their hearing generations ago, and now must communicate through visual means. There are three classes in their village: artists, miners, and suppliers. The artists, who are the upper class, observe everything that happens and then record the events through art and calligraphy for the rest of the town to read, kinda like journalists. Fei is an apprentice. The miners and suppliers provide metals to a town further down the mountain via zipline, and the town sends food in return. The zipline cannot hold enough weight to transfer even one person, let alone groups of people, and the descent is too dangerous to make on foot, so this is the only contact with the outside world that they have. Mysteriously, an increasing number of villagers have been going blind, particularly among the miners. With the decrease in production, they are receiving less food from the other town - and they were barely receiving enough as is. With so little to go on, everyone is stuck in their roles, because it's the only way for them to make things work. Fei dreams of being able to paint beautiful landscapes and loves brilliant colors, but she will never be allowed to paint anything more than the news, despite her tremendous artistic talent. In addition, she is worried about her older sister, Zhang Jing, going blind and losing her spot as an apprentice, and she is dreading her eventual marriage to the one of the other top artists, Sheng, because he's kind of a cruel, pompous elitist. She is not allowed to marry the boy she actually loves (and has known since childhood), Li Wei, because he is a miner, and artists only marry other artists. On the particular day that the story opens, a few things happen: a servant in the artists' court is discovered to be a thief, which is one of the highest crimes, considering the scarcity of the food; Fei encounters Li Wei after not having seen or spoken to him since she was offered the position of apprentice and had to end their relationship; and the village receives word from the town below that their request for more food has been denied, and as punishment for such a request, their supplies are being cut in half, which creates panic for everyone. So, yeah. This sounds AMAZING. I'm a big fan of Richelle Mead, having read her Vampire Academy and Succubus series, and when I heard about this book, I knew I would have to get my hands on it. First of all, Asian characters. There aren't enough POC main characters in YAF generally, and when I realized this would be a fantasy novel with Asian characters, I was instantly sold. Because look, it doesn't happen often, okay? And I think I trust Richelle Mead enough to do a good job. I was reading the preview with a sharp eye. There are so many pieces of media that resort to stereotypes or tired old cliches when portraying other races and cultures, so I'm a little hypersensitive to stuff like that. I did not get the sense that that was happening in these chapters. I was especially being hyper-vigilant about any mention of eyes being described as "exotic," "almond-shaped," or "slanted," and I don't think I saw any mention of that, which is good because not only are those descriptions old and tired, but it also wouldn't have made sense, since the story is told in first person narrative, and why would Fei describe anyone's eyes as exotic when she's grown up in this highly insulated village for her whole entire life? It wouldn't make sense. I would even dare to say that if it weren't for the names and the book cover, this story could've been about people of any race, any culture, stranded on a mountain. And that's exactly what makes me appreciate this story. 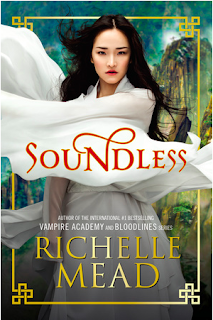 It COULD'VE been set anywhere (as far as I can tell), but Richelle Mead chose to make the characters and setting Chinese, and I appreciate that. It's kind of what I was saying in an earlier post, about how white is often considered the default in our society when we're creating stories, when there's no reason why that has to be the case - especially in fantasy, where you have to suspend disbelief anyway. So kudos to Richelle, for making that choice and for doing a really good job of it, so far. Second of all (I know, that was a loooong first point), as you can tell by the plot, ability and disability are central issues to the story. Literally, no one in the village can hear. And it's not like they don't know what hearing is - there are first-hand accounts in their library from the first generation of ancestors to lose their hearing, so they are aware that they are missing a sense. And because of this, the possibility of going blind ends up being an absolute nightmare, and it's happening to more and more of the villagers, and they don't know what to do about it as it is affecting their economy and their ability to live day-to-day. Third, which I realized as I was reading the preview, this book deals with an oppressive society and poverty and social inequalities, even within their small village. It reminds me a bit of The Hunger Games and the disparities between the districts and the Capitol, and I'm curious to see where this goes and how it gets handled.